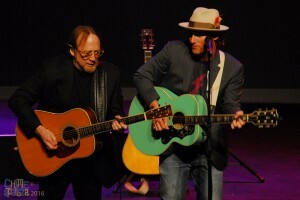 Singer Stephen Stills performing with his son, Chris, at the 2016 CHIMEaPalooza celebration. Photo courtesy of the CHIME Institute. Celebrities from all walks of stardom — including Golden Globe-winning actor Colin Farrell and singer Ruby Friedman — will gather on Saturday, Feb. 25, to celebrate the CHIME Institute’s continued success as a national model for inclusive education. The annual CHIMEaPalooza event is held to raise funds for the institute, a nonprofit organization housed at California State University, Northridge. In addition to Farrell and Friedman, the lineup of speakers and performers includes actors John Ross Bowie, Cedric Yarbrough, Melody Mooney and Frank Caeti. The event is scheduled to begin at 7 p.m. at the El Portal Theatre, located at 5269 Lankershim Blvd. in North Hollywood. The CHIME Institute’s dedication to inclusivity and diversity will be expressed in the show’s theme, Cox said. Pre-sale tickets are available for $60, but will increase to $75 after Feb. 18. Admission includes access to a pre-show reception from 6 to 7 p.m., the show from 7 to 9 p.m. and an after-party that ends at 11 p.m. Tickets can be purchased at www.chimeapalooza.org. Established in 1990, the CHIME Institute is a national leader in developing and implementing model educational programs and dynamic research and training environments to disseminate best practices in inclusive education. The institute’s research and training center is housed in CSUN’s Michael D. Eisner College of Education. The institute began with an early childhood education program housed on the CSUN campus. The success of that program, coupled with the needs of the community and sound research, prompted a group of parents and CSUN faculty to develop a public charter elementary school in 2001 and a public charter middle school in 2003. The two schools merged into a K-8 school located in Woodland Hills in 2010, which was later named a 2016 Hart Vision Charter School of the Year by the California Charter Schools Association. Inclusive education at CHIME means that children who reflect the demographics of the surrounding regions learn side by side. CHIME’s model allows for the individual needs of each child to be addressed in a manner that enhances each child’s strength, while also providing educational progress. CHIME also serves as a model for educators through its partnerships with the Eisner College and the Los Angeles Unified School District. It facilitates research opportunities and regularly hosts visitors from around the United States and the world who are interested in replicating its successes in their own schools. The institute has been recognized by the U.S. Department of Education as a model for full inclusion of students with disabilities, and for providing a blueprint for local schools across the country. Proceeds from CHIMEaPalooza will go toward supporting inclusive practices in the institute’s early education programs and charter school. For more information about the CHIME Institute, call (818) 677-2922 or visit www.chimeinstitute.org.